BIG K BBQ specializes in catering and to-go orders of custom smoked meats for your special event. We can handle 15 to 1500 people, and we offer everything from full-service buffet-style meals, drop off everything hot and ready to eat, or order it take-away where you pick it up and go! Featuring tender smoked ribs, mouthwatering pulled pork, scrumptious chicken, delicious beef and many more main dishes. Our appetizers are hearty choices: pulled pork sliders, sticky chicken skewers, jalapeño poppers (stuffed jalapeño halves wrapped in bacon and grilled), meatballs (sweet & sour, bourbon or BBQ), peel & eat shrimp – served chilled on ice with cocktail sauce – and more. Don’t leave out the sides! Our specialties are Smotatoes, BBQ beans, homemade mac and cheese, potato salad and Carolina cole slaw. We also have cornbread casserole, Caesar salad, green salad, broccoli salad and B K creamed corn. 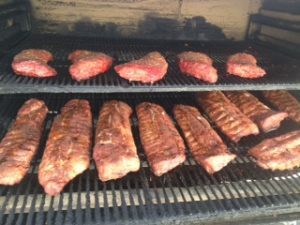 We are available for your special event, be it an anniversary, business open house, company party, graduation, sporting event, wedding or anniversary, we can provide you with great BBQ. Whatever your event is, give us a call for an estimate on price per plate and service. We include plates, napkins, utensils and condiments. 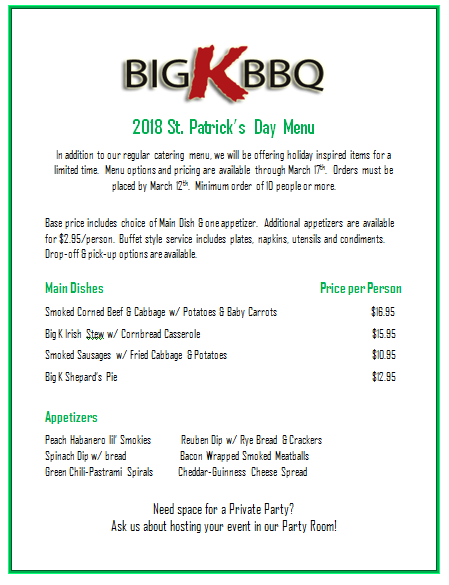 Our catered lunches range from $10 to $15 a person and our dinners are $12 to $20 with base price including your choice of two meats and two sides. Our head chef, “Cap’t K” is a certified Kansas City Barbecue Society (KCBS) judge and competition cook. The KCBS, is a famous nonprofit organization dedicated to promoting and enjoying all types of barbeque! It is is the world’s largest organization of barbeque and grilling enthusiasts with over 20,000 members worldwide.